As Sandy’s sidebar states, the Triton Reference is not some revolutionary advance over the Triton One, but it does make meaningful sonic advances in every respect and in ways that seem to more than justify its costs in comparison with other speakers in anything near its price range. One of its most important features is to combine better performance—while also making the loudspeaker compatible with a wide range of electronics and cables—with a balance of sound qualities that make it a pleasure to listen to over extended periods of time. The “gee whiz” factor in the sound of a new speaker disappears when you realize that it involves added coloration and/or produces listening fatigue. Like the Triton One, the Triton Reference has a very smooth overall timbre through its frequency range, with deeper bass, smoother midrange with more detail in the upper midband, and a cleaner treble with a great deal of air. This is particularly true if it is tilted so the tweeter is directed at the listener’s ears in the primary listening position. It is a remarkably seamless speaker in timbre/frequency response, soundfield, and imaging for anything close to its cost. My initial reaction was that the Reference did have a slightly “soft” or warm voicing, but a combination of break-in and better adjustment of its subwoofer level made it clear that the Triton Reference had excellent upper midrange and treble detail but without any of the touch of hardness that can occur with some dome tweeters or with speakers that are voiced to emphasize detail by adding energy in the upper midrange. It was apparent that the Reference did have the all warmth it should have, and that its reproduction of the lower midrange and upper bass was exceptionally well balanced. This is a speaker that minimizes listening fatigue even when the music is miked too closely, but does not mask upper midrange detail. It also measurably reproduces highs up into the supertweeter region. 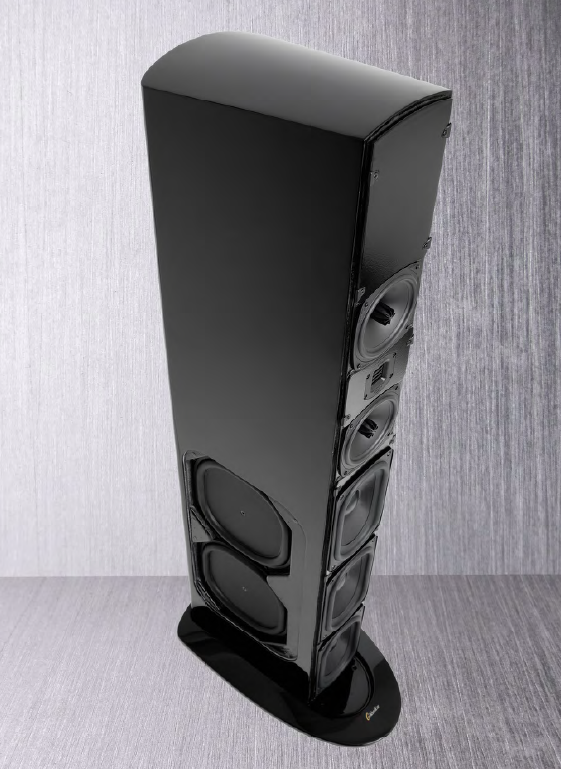 GoldenEar’s technical literature claims the Triton Reference has substantially improved crossovers with upgrades to better-sounding components, such as film capacitors, that may help explain its improved coherence. At the same time, the speaker’s pleasing sonic qualities may also reflect the use of new drivers—including a new ribbon and upper-bass/midrange—in a redesigned array. What is equally important is that the Triton Reference has a remarkably coherent set of dispersion characteristics and a wider, more stable, and exceptionally detailed soundstage. In fact, if you audition this speaker, I would suggest bringing recordings with truly demanding and natural soundstages, so you could hear how well reproduced they are. Jazz at the Pawnshop is one classic example that most audiophiles possess, but a really good natural recording of a symphony can be even more revealing. I have a 96kHz/24-bit version of a Tauno Hannikainen and Tossy Spivakovsky recording of Sibelius’ Violin Concerto that was originally captured on 35mm tape back in 1960; in both the digital and LP versions it’s a classic. A properly set up pair of Triton References (widely spaced with carefully adjusted toe-in, good spacing from the sidewalls, and enough space from the rear wall to get smooth, deep bass) playing back this source file revealed a wide range of subtle aspects of this recording’s imaging with excellent soundstage width and full centerfill. The tape hiss on this recording is a minor distraction, but the Reference’s ability to float such a detailed and natural soundstage still made this concerto a true pleasure even nearly 60 years later.